Here you’ll find information on venous disease, its causes, and specific types of venous disease. Venous disease describes abnormalities of the venous system, which usually results in enlarged veins that serve no useful function. The cause of the enlargement and malfunction of the veins is usually excessive pressure exerted by the blood on the thin walls of the veins. This excessive pressure is usually the result of abnormal valves and gravity. Valve malfunction is most often caused by the stretch and sag of the valve ring wall. 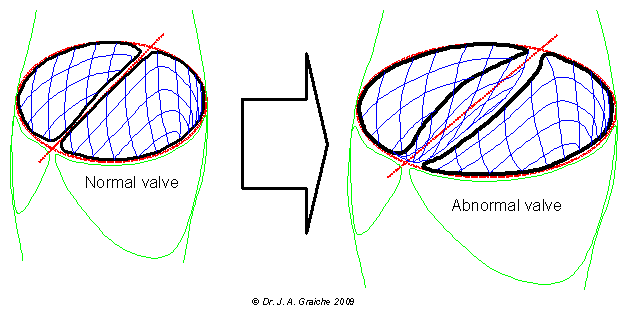 The diagram below demonstrates the difference between a normal and an abnormal valve. For these reasons, prevention measures should target contributing factors that can be reversed. There are many different forms and grades of venous disease. For this reason, it may present in a wide variety of ways. Symptoms produced may vary dramatically but are often dependent on the site and severity of the venous disease. The venous system may be divided into three almost separate compartments. 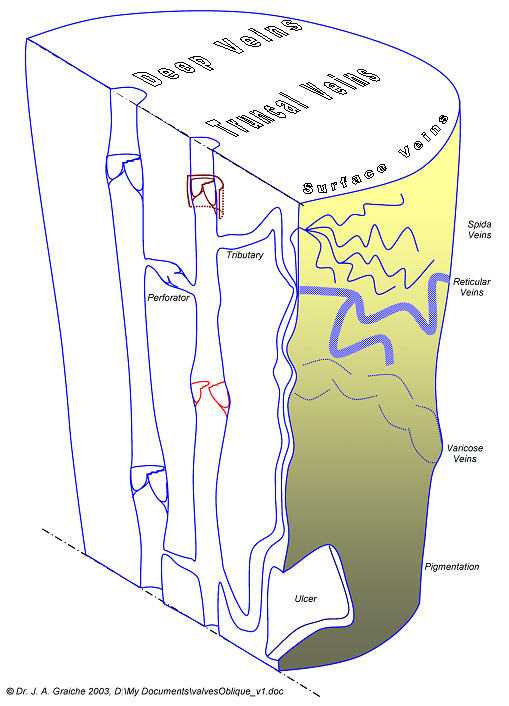 Surface veins begin at the fine capillary level within the first 1 to 5 mm of the skin. This component of the venous system is chiefly responsible for the visible blood vessels on the surface of the skin. These small vessels ultimately reach and drain into the truncal veins. Symptoms caused by surface vein disease are mainly cosmetic, however patients with extensive disease often describe a burning sensation or excessive heat over the affected regions. Abnormal vessels usually develop over the upper side of the thighs and behind the knees. Later, abnormal vessels may spread to the inner thigh and lower leg. It is worth mentioning that approximately 15 to 25% of patients who present with a sole complaint of a ‘surface vein’ problem actually have truncal disease when examined with duplex ultrasound or vascular Doppler. Treatment options are almost exclusively limited to Micro-sclerotherapy (MSc). The truncal veins convey most if not all the surface blood into the deep vein system and this accounts for approximately 15 percent of all the blood returned to the heart from the legs. Symptoms that develop from truncal venous disease include; leg ache, heaviness, pain, burning sensation, tingling and diffuse dull throbbing pain. With more severe truncal disease patients may also develop; leg swelling, skin pigmentation, skin scarring and in rare occasions skin ulceration. Exercise rarely improves the pain and may actually worsen symptoms. This may be attributed to the fact that exercise causes an increase in leg blood flow and if the venous return is malfunctioning, then this increase load will put greater strain on the venous system and hence symptoms. This system can not be visualised without the aid of vascular Doppler and or duplex ultrasound. It is most important that you understand the results of your venous leg scan. Treatment options include Ultrasound-guided sclerotherapy (UGS), surgical stripping, surgical phlebectomy, ambulatory phlebectomy (APh), ambulatory ligation (LIG) and endovascular laser ablation (EVA). Venocuff© surgery may be offered to patients with repairable venous disease. Ultrasound-guided sclerotherapy offers an alternative to repeat surgery in patients who have already had one or more surgical procedures in the past. Disruption to this system results in severe symptoms such as leg swelling, large varicose veins, skin scarring, skin pigmentation and skin ulceration. Unfortunately, treatment options for the deep system are very limited. Speak to your physician for more information on your specific case and potential treatments. Disease in the venous system may develop in any one or all of the three compartments mentioned: surface, truncal, or deep veins. The most common presentation is progressive disease in the surface veins followed by truncal disease and then rarely, deep venous disease. Identification of disease grade is of utmost importance when planning treatment. Usually a combination of treatments is employed due to the existence of multi-system disease and offers the best overall results.